Niffer’s Place was opened in Auburn, AL in 1991 by Keely Beasecker, Auburn University Alumni and AU Swimming Alumni. Her concept was good food and excellent value in a fun atmosphere. 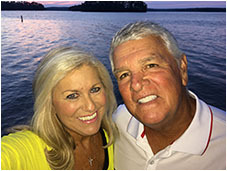 She did it right and loves to hear that people enjoy the food and friendly service in an atmosphere that defines FUN…thus another location Niffers Place Lake Martin! Looking for an affordable, family oriented restaurant at Lake Martin? Niffer’s Place Lake Martin is where the families gather for great food and fun for the whole family in a casual atmosphere. Niffer’s established their second location at Lake Martin near StillWater’s in the Spring of 2002. They have an expanded patio and deck that allows you to enjoy your favorite meal in the great outdoors.Of course, if you prefer there is plenty of room indoors to kick back and relax. Good old fashioned outdoor games are available for kids of all ages. On cooler nights the they light up the fire pit to warm up the atmosphere a bit. Niffer Place Lake Martin has live local music on certain nights, trivia night, charity bingo, kids night and burger night! Niffer’s Menu has a variety of choices that are sure to please any palate! Whether you are spending your day at the lake or your day at the office – you will get hungry! Niffer’s offers daily lunch specials from $5.95 as well as their famous boat drinks, famous specialty appetizers, fresh-marinated chicken, sandwiches, salads, wings and entrees! Ask about the four different ‘Niffasaurus Burgers‘. Eating all of the ‘Niffausaurus the Beast’ or ‘Niffasaurus the Original’ can earn you the prestigious Niffasaurus Bumper Sticker. The ‘Beast’ is two pounds of ground beef with EVERYTHING on it while the ‘Original’ is a mere one and a half pounds. Niffer’s Frequent Eater Club is the ‘fastest way to free food’. GET THE APP that Serves Up FUN! Scratch and Win Lunch Game, Discount Coupons, Weekly specials and more!